Fair Isle Bird Observatory: the Warden's diary: Ahoy. The weather is much better today, so the wardening team will be 'at sea' for the day counting the island's sadly dwindling Kittiwake population. 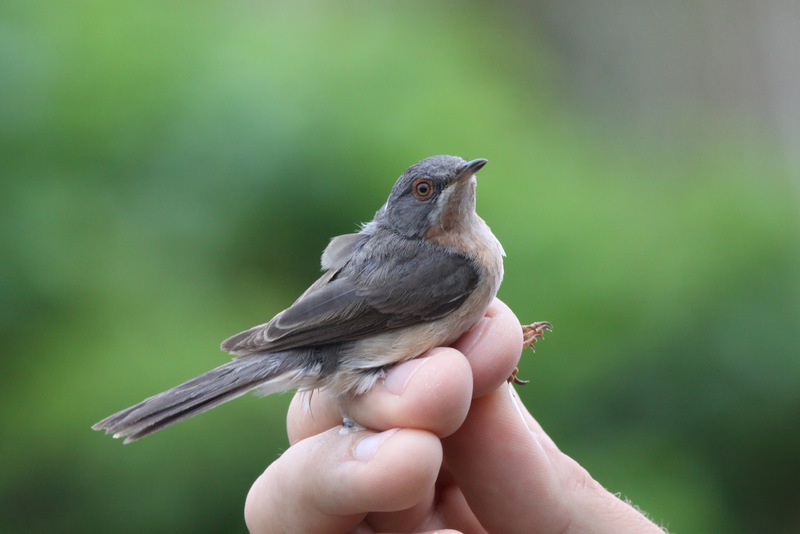 However, just before we head out, here's a picture of the young male 'western' Subalpine Warbler caught on morning traps today by Richard. Always a nice way to start the day, although it will leave us wondering what else is on the island whilst we're not! I don't doubt this is a Western Subalpine as it was trapped and examined in the hand, but this single photo makes it look almost light pink on the underparts, recalling the tone of Moltoni's :-) Perhaps an artefact of reflected side lighting? It does look pinker, although I think that is (as you say) down to the lighting as much as anything else. DNA analysis also showed this bird to be cantillans.